Wedding Traditions: Why Do All Bridesmaids Dresses Look Alike? This week we’re wondering: Why do all bridesmaids dresses look alike? In the time of the Romans, law dictated there be ten witnesses at a wedding. Each witness was to dress as similar as possible to the bride and groom in hopes of confusing the evil spirits and scaring them away. These days, this tradition has been pushed to the wayside, and bridesmaid dresses are about one thing and one thing only…fashion. Since every bridal party does it differently, we thought we’d give you a chance to check out how close or far modern ladies are straying from this tradition. 1. We find it hard to believe these little red numbers could look bad on anyone. Falling just above the knee, the length of the dress gives it a push of class, while the neckline gives it a touch of sass. 2. We’re not going to lie to you…this dress is a hard wear. You’re going to have some stature on you to pull this off, because this clingy number is a whole lot of dress. 3. 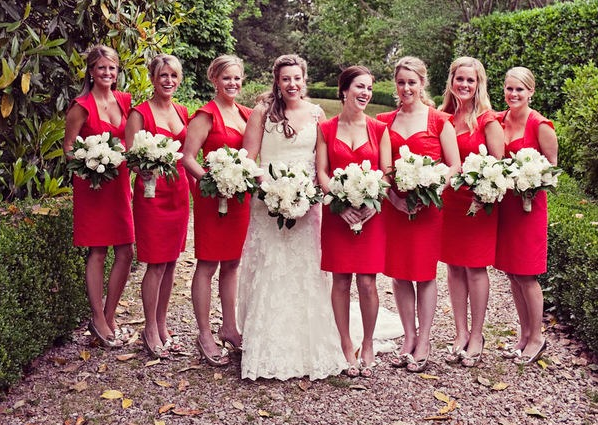 All of these bridesmaids are smiling and for good reason…they look adorable! A good shade of yellow is guaranteed to add a happy splash of color to any occasion. 4. This dress is fantastic, but what really makes it is the pale green ribbon. Transforming what could be a flowing, shapeless frock into a gorgeous A-line, the ribbon effect instantly masks any problem areas. 5. It’s not often we see two-piece bridesmaid ensembles, and we are absolutely thrilled to have stumbled upon this one. These ladies’ simple navy shirts matched with floral printed skirts look fun yet refined. 1. Different styles, same color and length: This look works well because it allows each girl to sport the style that best fits their body type, while simultaneously looking uniform thanks to the consistency of color and length. 2. Vintage picks: We love these charming vintage dresses splashed with floral prints, but beware if you’re going this route; you never want to distract attention away from the bride. 3. Different styles, same hue: These girls clearly have style. Though rocking a variety of dress styles and colors, the ladies coordinate the light beige hues of their outfits impeccably. 4. Entirely mismatched: Willing to get a little wild? Let your best ladies wear what they like as they stand by your side at the alter. Even if the dresses are all completely different, you can still have a preview to determine who should stand next to who in order to create beauty instead of an eyesore. 5. Same color, different styles and lengths: Like we said above, keeping the color of the bridal party’s dresses somewhat similar helps keep the main focus on the bride. This beautiful blue shade looks fantastic on all skin tones, and the flexibility of the dress styles and lengths allows each girl to remain in her comfort zone. Are you a sucker for fabulous fashion? We have more for you! Just click here.